The sights and sounds of solidarity are ringing through the Windy City today. Thousands of hotel workers are on strike, fighting for the dignity and security they’ve earned through hard work every day. Represented byUNITE HERE Local 1, the workers have walked out of 26 hotels across downtown Chicago. Working people aren’t standing for mistreatment. After decades of living under broken political and economic rules, we’re demanding better than meager wages and slashed benefits. We’re marching, organizing and—when necessary—striking for the brighter future that we deserve. When hotel management refused to provide year-round health care, workers across Chicago put their foot down. 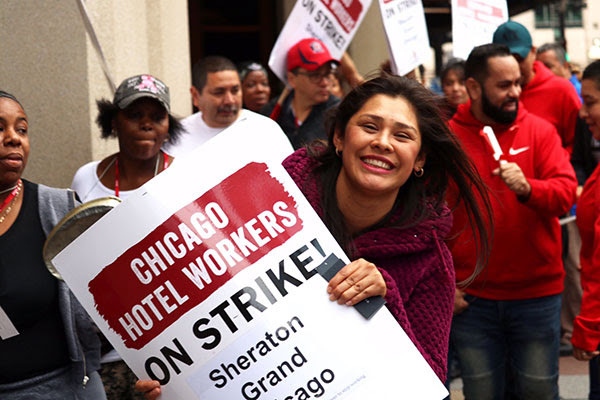 Show your solidarity, and check out the full list of striking hotels. 6: Number of days that Chicago hotel workers have been on strike.